I wouldn't particularly describe myself as an anime fan. I've watched and enjoyed a few anime series and films, and I like Studio Ghibli. I know many people who are far more interested in, and knowledgeable about, anime than me, so don't feel I can claim a 'fan' title. 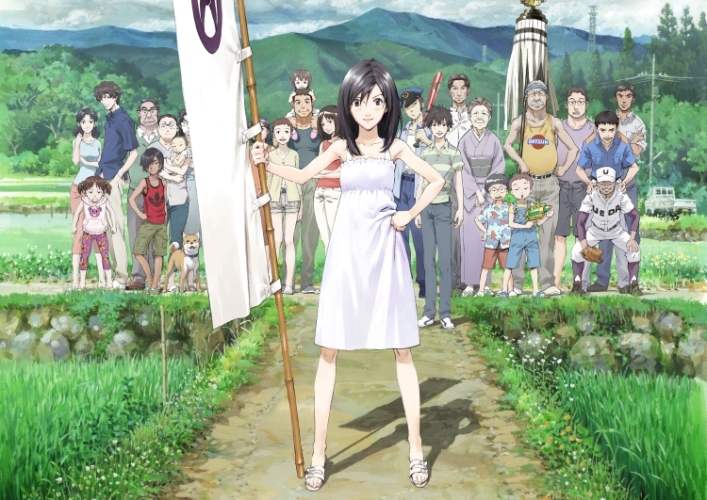 So, as an interested not-quite-fan I just want to say that Summer Wars is absolutely amazing. It really is an excellent film and I'm definitely putting it on my Christmas list. It's about Kenji, a high school maths genius who agrees to accompany Natsuki to her great-Grandmother's 90th birthday celebrations as a favour. 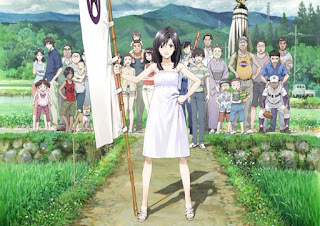 Once in the busy bustle of her family's ancestral home he discovers that Natsuki has told everyone he is her fiance. Shy, good-natured Kenji goes along with it and finds himself overwhelemed but delighted by Natsuki's big, noisy family. Meanwhile there's trouble in Oz (the colourful cyber-world that stands in place of the internet within the setting of the film) as a dangerous hacker is causing mayhem on an international scale. So much about this film was good. I liked the way Oz was designed and shown on screen, it was realistic and understandable as an online 'space' where people can completely design and fully use their own avatar. Showing a virtual world is something that can best be done in animation and it's clear the makes of this film knew exactly what they were going for. As a virtual platform that combines chat, gaming,shopping, learning and infrastructure it is a wonderfully varied and flexible setting for animators to design and work with. The action switches between the real-world Japanese setting and the bright, fantastical online world - where the consequences and stakes are high enough to be vital to the offline world as well. The characters were great. Kenji and Natsuki and her big family all felt very realistic. I loved the stern but loving figure of the great-Grandmother, the aunts/cousins who were doing all the cooking and organising. I really felt for the characters, both those primarily involved in the plot and those on the periphery, who still had their own personalities and concerns. The family as a group felt big and warm and comfortable and I found that it reminded me of some of the best families in Diana Wynne Jones books. The storyline was interesting and though some plot lines were foreseeable other bits were unexpected and the whole thing was full of emotion. The way it encompassed the massive and international down to the personal and intimate all in one story was excellent. There were a couple of times -during sad bits- when I was truly close to tears, but there was also plenty of warm humour. Then at the end I felt such a strong rush of emotions. It's good when you watch something like that. I strongly recommend this film. Even if you don't think of yourself as an anime fan it's a wonderful piece of storytelling. Various anime I've seen have convinced me that if the apocalypse involves either small, cute, fluffy creatures or big, gestalt monsters the Japanese will be the only nation prepared for it. Very much enjoyed this urban fantasy police procedural, I expected to as I've heard mostly good things about it. Set in London (natch) this book is about Peter Grant, a young mixed-race police officer who takes a witness statement from a ghost while guarding a crime scene. This surprising incident leads to him being placed in a very specialist division of the Metropolitan Police force, which deals with the supernatural and consists of Peter and his superior officer Inspector Nightingale. The book was an amusing and exciting read, it dealt with some pretty nasty killings and unpleasant magic and while certain plot points were as I expected there were twists that left me surprised and keen to read on. 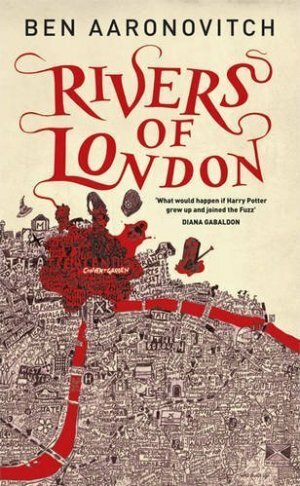 I liked the modernised take on mythology with the various rivers that flow through London being personified, mostly by black women. The comparison between the white, country dwelling Father Thames and his streams and tributaries and the black, urban Mother Thames and her daughter-rivers was interesting. Like Mike Shevdon's Sixty One Nails this is an urban fantasy which includes the countryside and acknowledges its difference to the city without making it out to be scary. I very much enjoyed this book, though I did find the scenes which involved rioting and fire eerily prescient. Also the front cover with all that densely-packed writing was distracting and fascinating. I don't usually mention cover art much, but in case I was very impressed. I was first given Good Omens for my 16th birthday. My father says he first read Lord of the Rings when he was 21 and he has reread it regularly ever since then, I can think of several occasions from my when I saw him reading it. * That is what Good Omens is like for me. I have read and reread it so many times that the book is looking distinctly worn. Were it on the shelf at work I'm sure my boss would consider selling it and getting a better looking copy. I love those moments that I read then immediately reread, sometimes numerous times, just to play the dialogue and expressions and reactions through in my mind until they're as clear as they can be, as though I'm actually watching or directing them. I pretty much only do this with dialogue between main characters, usually when there's humour behind the conversation. There are quite a lot of moments in Good Omens that I do this with, especially conversations between Crowley and Aziraphale. In fact I'd pretty much got a scene-by-scene of their entire drunken conversation in my head before I was in my twenties. I suspect reading Good Omens is partly why I like Queen. At 16 I still liked a lot of mainstream music (later working in a clothes shop, and influence from the heavier tastes of friends, would spark a growing appreciation of rock) but I was rarely passionate about music. I knew Dad liked Queen and had heard several of their songs, but we were not a very musical household and it had mostly been in the background. Good Omens was the first book I've read that had a soundtrack. The references to the Greatest Hits of Queen are often sarcastic and at first I thought that the authors didn't like the band. Then I realised that the lyric quotes and the jokes were a sign of appreciation. When I heard certain Queen songs I associated them with Good Omens and though I'm sure Queen would have been a part of my developing musical tastes anyway, I'm sure that association helped. When I hear that bit in 'Bohemian Rhapsody' I still often think of Crowley giving a strangled scream and punching his foot to the accelerator of the Bentley just as the song seems to explode. Good Omens was in some ways my bridge from Pratchett to Gaiman. I needed to buy some socks and I had never seen Neverwhere written down. I remember this because later that day my sister saw the note and assumed Neil Gaiman was a designer/brand of socks that I'd been warned against. 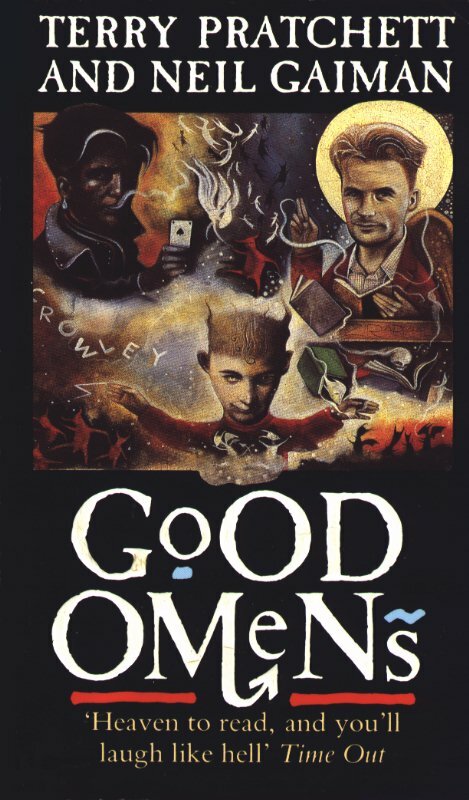 Initially I noticed all the Pratchetty bits of Good Omens -the footnotes, the way Death spoke, some of the description, characterisation and jokes, which chimed with what I'd been reading in Discworld. 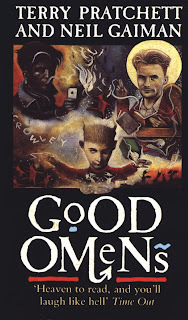 After a few years, during which I read Sandman, American Gods, Stardust and various short stories, I reread Good Omens and noticed the Gaiman-ness -the GK Chesterton references, the speculations about the nature of the divine/demonic, some of the description, characterisation and jokes. I like that when rereading I still pick up on things I missed before. This doesn't happen every time but it happens enough that I'm still surprised and delighted. Some of it was jokes I didn't get at first due to still being young and innocent (the Coitus Interruptus Award for telemarketers was suddenly amusing - although I later wondered how they knew), others were references to things I hadn't experienced or didn't entirely get until they had a chance to sink in and become ingrained in my worldview. These are all reasons why I love Good Omens and if you don't really know what I'm talking about I suggest you find a copy and find out. You won't regret it. * I must say I do not have much love for Lord of the Rings, though I can appreciate its importance to the genre. My dad read The Hobbit to me when I was 8 and I remember enjoying that -though I don't seem to recall the ending, so I think we must have got interrupted. I tried to read LotR when I was 15 and got most of the way through Fellowship but at that point the films were coming out so it just easier to watch. I honestly am reading, I'm just being slow to post about it again. This picture bears almost no relation to the story. I really enjoyed this fantasy written in the 1920s by one of those little known/recognised early female writers that need a higher profile than they have. It really wasn't what I expected, not quite sure what I expected but I imagine my expectations were coloured by all the modern fantasy I read. The book was written before Tolkien set the stage for traditional fantasy tropes. So what do you call something that predates the traditional? I have no idea, and I'm not sure I'm knowledgeable enough to answer that, but it actually felt different to a lot of other books I've read. The story is set in the country of Dorimare, which borders Fairyland. The capital Lud-in-the-Mist was ruled by a rational-minded mercantile upper class who relied on trade and put their faith in the law. As the fanciful and magical have no basis in law the upstanding citizens of Lud-in-the-Mist disregarded the neighbouring land, it's mischievous inhabitants, and dangerous exports. So when entrancing fairy fruit starts affecting the great and good of Lud-in-the-Mist it takes a man with a fanciful frame of mind to solve the problem. The protagonist Nathanial Chanticleer is a rich older man, upstanding citizen and Mayor of the capital - a very different sort of hero to most fantasy novels. This is more a midlife crisis than a coming of age story, though that perhaps sounds uncharitable. It's made clear that though he seems like any other respectable Lud citizen, Nathaniel Chanticleer has always had a wistful, introspective side that doesn't fit with his peers. The book has a rich descriptive style that you don't tend to get so much nowadays, and while there is a lot more telling (as opposed to showing) than I'm used to, it works fine in a period piece. The humour is mild and wry, the fantastical elements are mostly hinted at and are made mysterious rather than overt. I had expected to see more of fairyland, but the impact of magical encroachment into the tight-laced Lud society worked well. There's a strong comparison between the country and the town. The country folk stuck to the old superstitions and, in this book, were proved to be right, while the townfolk consider themselves more sophisticated and enlightened. However it's made very clear that their insistence in dealing only in the rational and understandable blinkers them and leaves them unprepared for things outside their ken. It also felt as though the fairy fruit, contraband magical food which is referred to only euphemistically, is an analogy for all sorts of disruptive influences within society. The most obvious parallel is with drugs, as the fruit must be smuggled into the country and distributed in secret. I'm sure that a reread would bring other themes to mind. 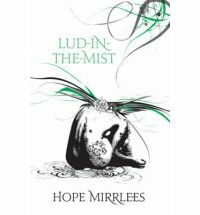 I enjoyed reading Lud-in-the-Mist as I was interested to see the kind of fantastical story written before Grandfather Tolkien, and because it worked well with my general enjoyment of fairytales and the mythic. The country of Dorimare -fictional though it may be- is rich in history and folklore and the references to traditional tales, songs and images felt very nostalgic even though they were inventions of the author. My short story 'Lupa di Roma' has been published by Title Goes Here Magazine in their October Web Edition (1.10). The web editions are free to read so I encourage you to go and have a look. I am very happy about this, and also very pleased with the way the story was described in the editorial. I doubt any description I'd written would have sounded nearly as impressive. Apparently I've written Mythpunk. I didn't mean to, but as the story is based on the Roman foundation legend I guess it fits the subgenre. I finished this series of Doctor Who the same way I'd started it, watching in a hotel at a UK convention. There were some definite differences in the circumstances, I was in Brighton not Birmingham. I was in the hotel lounge with about a dozen other people watching on a large TV, rather than watching with hundreds of people in a big room with a projector screen. Still the parallels framed my viewing of the series. Shiny and fun. Lots of CGI and world creation that reused material (Romans, Winston Churchill, pterodactyls, that beard) from the last few series and other Whoniverse shows. Obviously going for impressive visuals, which succeeded. Amy & Rory are sweet again, and this time Rory's switch is turned to brave. Rory doesn't get much of a character arc, he's a compassionate man who loves his wife and seems to get killed a lot. His characterisation can be described as: Rory Williams: Everyman Hero/Bumbling Coward [delete as appropriate to episode plot]. It's more a pendulum than an arc. Blue head-in-a-box guy is amusing. If you're just a head in a box then it makes sense you'd be snarky. And the robot tesselect thingy is the decoy, as was guessed by my colleague after 'Hitler' (the Flesh Doctor clearly being a red herring). This is good in terms of creating a happy ending, though it's not surprising or suspenseful. I think we all knew what The Question would be. What's hiding in plain sight more than the title of the show? What's happening now? I'm intrigued but this broken history (which actually feel more like an alternate world, because it clearly has it's own rules and processes and continuity) feels little tangential. It's taken a month (real time), goodness knows how many months (in-show time) and an alternate world (plot line) for me to discover that yes, Amy was actually very upset and pissed off that her baby was kidnapped. I know such emotions should be a given, but in TV if a character doesn't display some emotional continuity (even if it's done subtly or in the background) then we can only assume that they don't care and neither should we. The way it was handled it seemed as though the team needed to give Amy a reason to dispatch the baddie and it suddenly occurred to them that maybe the whole baby-stealing thing had ticked her off a bit. If a TV show is going to hit the reset button fair enough, but don't do it three weeks in a row then suddenly expect the viewer to buy an emotion plot arc a month later simply because it's convenient again. All I was asking for was a quick scene between Amy and Rory at a quiet moment, or even just a concerned/comforting line of dialogue to let us know that actually these characters are suffering. I can understand if they're resigned to let events take their course, but shouldn't we be able to tell that they're putting a brave face on it. I mean even if you want to all ignore the emotional characterisation (and I'm not sure why you would) from a plot POV the disappearance of Melody was supposed to be 'the farthest the Doctor will fall' or some such melodramatic gubbins. To have the cause of the Doctor's Great Fall routinely ignored by everyone later just leads to disappointment. So I don't really get how the Silence (whoever they were) engineered both a psuedo-Time Lord (if that's what they did) and a fixed point in time (which is definitely what that was because we were told repeatedly). Also if the Doctor's death is a fixed point in time then surely if he doesn't actually die then it's not a fixed point in time? Apparently a shape-shifting robot getting broken is in fact the event at the centre of that particular fixed point in time. Obviously we all knew that the Doctor would get out of it somehow, but this kind feels like cheating. All the timey-wimey stuff that was supposed to be a result of the Doctor's death and it actually happened because a very fancy robot got broken. So what did River tell the tenth Doctor just before she died if she doesn't know his name? What's so special about his name anyway? Why were Amy and River working with Madame Kovarian in weird-time world, they have every reason to hate her (assuming River knows who she is) and suspect her? River was brain-washed/raised to be a psychopath, is that all just fixed now? Why? Why did the TARDIS go to Amy's house just before it exploded? That was the one place/time it shouldn't have gone, River clearly didn't mean for it to go there, but she couldn't stop it. I'd assumed someone hijacked/hacked it somehow and it was all part of the Pandorica Opens/Big Bang stuff, but the whole thing seems to have been forgotten. Apparently the internetz have decided the TARDIS went there of it's own accord, but why would it go somewhere that would lead to it exploding? I've been wondering this for over a year! I assumed it tied into the wider plot as it was the main question left over from last year, but it just seems to have been ignored. This was our first Fantasycon and second full convention. We went to all the days at Eastercon, but had to leave in the evenings to get the train home, meaning we missed out on some of the party atmosphere. This time we were staying in the con hotel, so had no excuse. The weekend saw surprising and unseasonable heat. As a coastal town and famous tourist trap Brighton has a very definite season (I've been there off-season - at which point it's mostly just a town by the sea). Having a mini heatwave two weeks after the season ended clearly threw local businesses off. It also meant the the town was heaving with people over the weekend and most of the rooms at the hotel became uncomfortably warm. We mostly went to panels and sat in the bar, or else wandered along the seafront and beach. We utterly failed to go to any readings, signings or launches. I think next time we go to a con we need to pay more attention to who is doing what and look into what books we might like to get. Quiz - Our team ended up having the least points (despite receiving a comedy point for our ridiculous answers). It seemed that we mostly couldn't remember the answers until we heard them later, so we figured we'd be amusing instead. I mean Lanhkmar/Birmingham, Rand al'Thor/David - it's all basically the same, right? Best thing about the quiz, and it's real point, was that we met a couple of people who we ended up spending quite a bit of time with throughout the con. New, fun people to talk to are always good. Trends in Fantasy Panel - This was a very interesting and largely amusing panel, and probably my favourite panel. The discussion mostly covered traditional/epic/secondary world fantasy with some mentions of paranormal, but little about urban fantasy. There was much discussion of how trends came about and whether they were a reaction against 80s tropes. The panel was moderated by Juliet E. McKenna, who is becoming a convention favourite of mine. Rise of YA Panel - This discussion was interesting, especially considering my work with teenage readers. It was good to hear another library worker pipe up during the discussion. I agree with Stephen Deas's that the books have always existed, it's just the label and the market have been created by publishers/booksellers. I can kinda see why Sarah Pinborough thinks YA might be a barrier to kids reading adultbooks - personally I tend to refer to them as teenage books because that's what we call them at work. I think that's better as it means that as most kids want to read about characters older than themselves they'll probably move on to adult books of their own accord when they feel like they want to be treated as adults. Comics Panel -Very interesting and I was glad that the issue of women in comics was brought up (and nicely explained) as it's a key topic just now. There was a woman in the audience who clearly loved superhero comics, but was nearing the edge of her tether in regards to how she was treated as a female superhero comic fan. My heart really went out to her, she clearly felt very strongly that her passion for something she loved was being sorely tested. I actually said something (which sounded far more eloquent in my head I'm sure) about superheroes being the main thing people think of when they think of comics, and also about the popularity webcomics. The answers were roughly what I expected, but it was nice to hear what professionals thought. People - I met some great people. Several who I'd spoken to on Twitter before, some entirely new. It was just great to chat with people. I also found it incredibly interesting to hear authors/writers talk about their books and writing. I'm not used to talking about writing with people I don't know well.I'm usually pretty reserved about it, but clearly I'm missing a trick as it was great to just hear about it. Later, when I'd sobered up, it gave me plenty to think about. The Girl with the Dragon Earring - My husband got me a great piece of jewellery that looks like a dragon twined round my ear, and it was the first time I'd worn it. I got plenty of compliments, comments and someone took a picture.If you can't wear an ear-wyrm (which is my name for it) to a fantasy convention where can you where one? Heat - it was so, so hot. I do not do well when I'm too hot. I'm like a microprocessor, I need a certain temperature to operate at a full efficiency. Check-in - we had to queue for an hour to check in, meaning that I didn't go to a reading I'd meant to go to. It got to the point where I was quite excited just to be able to see into the lobby. The Hotel Room - our hotel room was air-conditioner adjacent. Meaning that even if we turned ours off (not that we could given the heat) the unit just outside the window would hum us gently to sleep anyway. I remember dancing energetically to incredibly cheesy music, mostly from the 70s I think, at the con disco. All around writers and publishing people danced like mad things. Me and a guy (didn't see his name badge) pointed Brian Aldiss towards the the reception & agreeing with him that the hotel was indeed built like a maze. The guy then said that the previous night he'd heard someone make a reference to God Complex, and that was how he could tell he was at an SF convention. Just a very quick post to say that I had a great time at Fantasycon. It involved a lot of travelling and more sunshine than I am accustomed to in autumn (or indeed summer sometimes). There will be a more detailed post on that soon (hopefully by Wednesday). I'm also going to write up the Doctor Who finale and Lud-in-the-Mist. I plan to get all this done by the end of the week, though goodness knows if that'll actually happen. I guess what I'm saying is... Watch this Space.